The Catalan giants welcome Getafe to the Camp Nou this Saturday. In the recently concluded UEFA Champions League Quarter Final draw, the 2008-09 champions drew Shakthar Donetsk. If Barcelona progress, they will meet either Jose Mourinho’s Real Madrid or Harry Redknapp’s Tottenham; neither will be an easy opposition. However, the most crucial match for Guardiola now would be the home tie against Getafe – a team which is capable of the most unusual results. The last time these two teams met in the Spanish League, at the Coliseum Alfonso, Barcelona got the better of Getafe. The visitors scored 3, while the hosts could only find the back of the net once. The holy trinity of Messi, Villa and Pedro notched up one goal a piece by the hour mark. Gerard Pique received the yellow card twice and the second offence was also awarded a penalty, which Manu converted. However, it was too little too late for the hosts, as they couldn’t recover from the initial Barca blitz. Barcelona now has a 5-point lead over Real Madrid. The lead was cut down from seven to five, as the Catalans drew against a spirited Sevilla, away at the Ramón Sánchez Pizjuán. However, a win against Getafe will put them 8 points ahead of Real Madrid, as Jose Mourinho’s men play one day later. Pep Guardiola will be without quite a few key members. Pedro is suffering from Hernia, while Puyol is still recuperating from his injury. Brazilian fullback, Maxwell has a groin strain, and recently Eric Abidal joined the list of casualties with an unfortunate liver tumor. The French fullback underwent surgery on Thursday at the BarnaClinic, part of the Hospital Clínic de Barcelona. Thankfully, the surgery went on without any complications, and Eric is expected to leave the hospital within a week, depending on his progress. An injury scare to Messi could have put Barcelona in further discomfort. However, the diminutive Argentine joined training on Friday after recovering from a knee sprain. Due to the absence of key members, Guardiola has added Andreu Fontàs, who will be a member of the first team until the end of the season; Martin Montoya too has been taken in. In the absence of Pedro, Bojan can expect a start. The latter scored an all important goal against Sevilla last week, to get the defending champions a point. 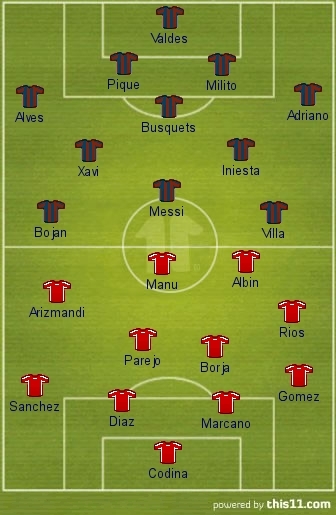 Messi will be in his usual position, supported by Villa on the left. The midfield trio of Xavi, Iniesta and Busquets are expected to start. The defense needs a major overhaul. Gabriel Milito is expected to get a start as the only recognized centre-back alongside Gerard Pique, while Dani Alves will continue his usual bombardment from the right flank. His compatriot, Adriano, should start from the left in the absence of both Maxwell and Abidal. The team from Madrid will be going into the match without wins from five consecutive matches. 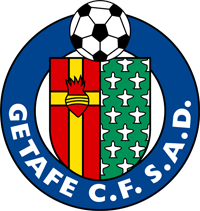 Last weekend, Getafe drew with Athletic Bilbao at home – not a very good result, prior to the match against Barcelona. Míchel’s men play fluid passing football, but they come up short on their defensive front, with a goal difference of -5 further substantiating this. They might go ahead, but how long will they be able to hold on to the lead should be the primary concern for the Azulones. This defensive frailty is something which Barcelona will look to exploit. “If we do things well and they don’t have a good day, Barcelona can be beaten,” said Victor Sanchez, who is on loan from Barcelona. In a queer encounter against Athetico Bilbao, forward Manu Del Moral scored not only two goals to give his team the lead, but also scored an own goal to cut down the lead. Getafe’s flimsy defense eventually succumbed to that and conceded on in the dying moments of the match, thereby dropping 2 points. Venezuelan striker Miku returns from suspension and will start for the visitors in all likelihood. Defensive midfielder Derek Boateng is unavailable due to suspension. 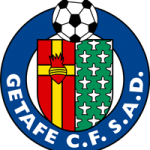 More bad news in the form of the unavailability of Rafa Lopoz and Adrian Colunga could be unsettling in the Getafe dressing room. However, a probable return of veteran goalkeeper Oscar Ustari is on the cards. The FIFA Ballon d’Or recipient is an automatic choice for this column. 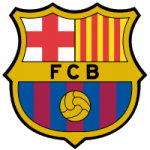 The 23-year-old received a knock to the knee in Barca’s 1-1 draw with Sevilla on Sunday, when he collided with opposing goalkeeper Javi Varas. However, he has recovered well and should be fit for the match. Getafe will definitely have a plan for him and Messi too will have a plan to counter that. Barcelona clearly enter this match as favourites. Getafe’s lightweight defense will succumb to the Barcelona attack sooner rather than later. 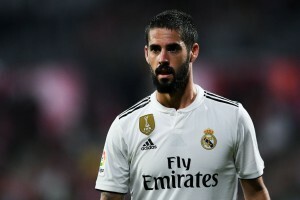 However, Barcelona too are devoid of a few key men at the back and the Madrid based side can expect to get a breakthrough.